The top non-official languages that are spoken at home by children and youth vary considerably by province and territory. 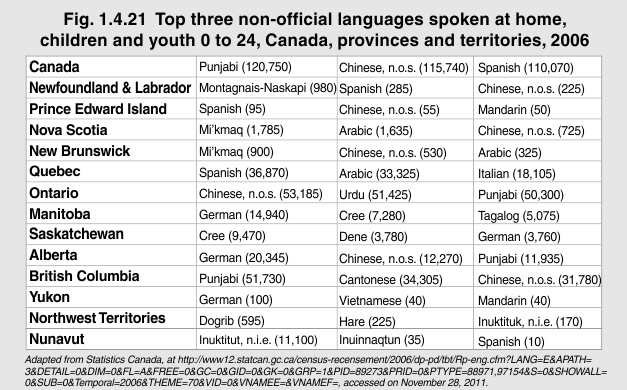 In 2006, the top three non-official languages spoken at home by children and youth under 25 in British Columbia were Punjabi, Cantonese and Chinese (not specified). In Québec, they were Spanish, Arabic and Italian. In Manitoba, the three languages were German, Cree and Tagalog, while in Saskatchewan they were Cree, Dene and German.